The Variant Creative template is the most downloaded template since its release, and it was also the first template to include a .PSD source file that makes it easier to customize its design. In this post, I will explain how to edit the .PSD and create a new header image for the template. Locate the layer called “Background image”. This layer is the one that will be replaced with a new image. The .PSD is 980 x 220 pixels, so cropping and resizing may be needed. I have chosen to insert a photo of the snowy backyard of my house, and resized and cropped it to make the size fit. The .PSD file includes design elements for both the 2- and 3-column layouts, so depending on which layout you want to use you may need to hide the two 3-column layers and display the two 2-column layers. 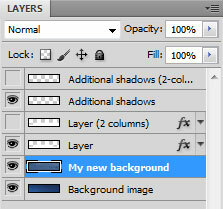 I will keep the 3-column layout, so I will not change the settings for the other layers. Make any adjustments needed to the new background, such as modifying the size and colors or inserting a logo or any other design element you may want to use. Just make sure that anything you add is placed below the column layout and shadow layers. Once you are satisfied with the result, save/export the result to a new .JPG image and name it front.jpg (to replace the default 3-column image) or front-2columns.jpg (to replace the 2-column version). Put the new .JPG image in the “img” folder of the template. If you want to keep the default background, you should rename it (for example to front-old.jpg) before saving the new image, or it may be overwritten. If you are happy with the result, then the new header is now ready and you can continue with editing the template itself. If you choose a background image with lighter colors, you may need to change the white color of the site title and slogan into something darker, to make sure that it is clearly visible. You can also apply a text-shadow to the CSS for the #header h1 and the #header p to make the text more visible against the background. It may also be a good idea to match the colors of the links to match the main color of the header image. Use the image editor to identify the color you want to use and get its hexadecimal color value. For my example image, I would want to use a darker blue color from the snow, so I use the color picker tool and find the color #37537b. This color can then be inserted as the link color in the variant-creative.css file, or as the accent color for headers or sidebar buttons. Tried this? Show your results! If you have used the included .PSD to make a header image of your own, feel free to show me the result and let me know if there is anything I could do to improve the included .PSD. Share your story, either in an e-mail or in a comment to this post. Where do you think are the best places to get free templates? Header graphics are perhaps not as important on a website as they once were? I know this may appear to be controversial, but I believe that we are now seeing a trend that we have not seen before. Do you agree or disagree? I am not changing the subject it just that I think we need to expand the conversation. I must first of all say that I am very impressed and grateful for your website, tutorials, and templates! I am now working on my web page without any previous knowledge of html or web design! I hope to upload it to the university website before the new academic year starts. Could you please help me insert my own photo (from my computer) into the Variant Creative template?